Each cycle, it seems like recruitment, candidate announcement and actual campaigns get under way earlier and earlier. It’s 20 months before November 2018 but multiple announcements are being made as I type by two House members who will be seeking their state’s open Governorships next year – Republican Jim Renacci of Ohio and Democrat Tim Walz of Minnesota. Their prospects are anything but clear as both are facing a bevy of statewide or other popular officeholders which make their own prospects precarious. More concerning to politicos in Washington is that it’s far from guaranteed that either seat would stay in their respective party’s hands. 2018 is likely to be an unpredictable year but at the very least, it is certain that the GOP will be on defense. Therefore, if neither man gains traction with their statewide bids, it’s not inconceivable that one or both could abandon their runs and opt to stay in Congress. Of the two, Renacci’s district would seem the better bet to stay put. Democrats held one version or another of Ohio’s Sixteenth Congressional District from a single term only once since 1950, from 2009-2011 when John Boccieri lost it to Renacci. Incidentally, the last Democrat to represent the district before Boccieri, John McSweeney, was also ousted after one term. Still, the district’s history could easily give Republicans heartburn. Both of those last two Democrats benefited from wave elections – McSweeney in 1948 when Harry Truman railed against the “do-nothing 80th Congress,” and 2008 when Barack Obama ushered in scores of new Democrats lawmakers. 2018 may be another anti-Republican year. Though Donald Trump roared in the district by grabbing 56%, Mitt Romney took 53% and John McCain received just 51% in 2008. Renacci himself barely scraped by after redistricting put a representative from Summit County, Betty Sutton, in the same district (Sutton is now running for Governor so the two could ultimately face each other again or Sutton could herself drop down decide to try to reclaim the seat). The district no longer contains Democratic Canton but does have other portions of Stark County, as well as Akron and Cleveland suburbs. In other words, just as voters opted for change last year, if they decide they want checks and balances or have buyer’s remorse with Trump, Ohio-16 could be ground zero for a takeover. As for his statewide prospects, Renacci’s message is tailored at getting “career politicians out of the way,” a theme that is necessary to draw distinction in a field of three. The front-runner appears to be Attorney General and ex-U.S. Senator Mike DeWine, but Secretary of State Jon Husted also is consolidating support. As if that’s not enough, Lieutenant Governor Mary Taylor is also in the mix. Renacci is among the most wealthy members of Congress (a Roll Call survey from 2015 pegged him at number 15) so, it’s not a stretch to think that his wealth could catapult him into a major contender. There are signs Renacci is trying to emulate another businessman who rode wealth to victory: President Trump. Renacci’s URL is “ohiofirst.com” But Renacci is more cerebral and lacks the bulldog pugnacity of Trump. The bottom line is that much needs to go right in order to become a top contender and it’s far from a sure thing that’ll happen before the Buckeye State’s filing deadline around the first of the year. So it’s still up in the air as to whether this seat is genuinely open. Walz very nearly found out the hard way how swingy Minnesota’s First Congressional District is. In November, in the shocker of a night that had many, he clung to his seat by a mere 3,000 votes against an underfunded challenger given little help by national operatives.The swing dynamics were at play in the national race. The 1st runs along the state’s entire Southern border from Wisconsin to South Dakota, and encompasses Rochester (the Mayo Clinic) and Mankato, but also fertilely Republican farmland. While Obama carried the district twice, Trump veered to victory 53-38% – a testament to why Minnesota only gave Hillary Clinton a microscopic margin. 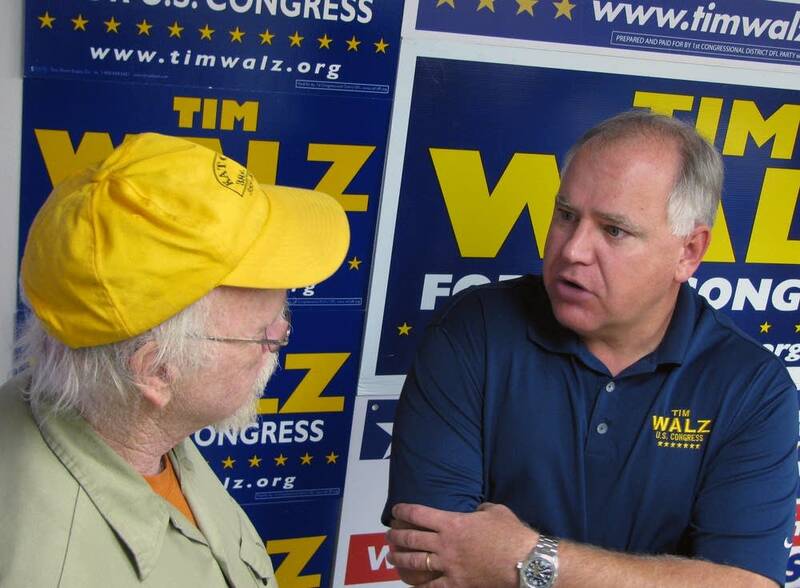 In fact, Walz’s district has changed partisan hands by the dozen. Democrat Tim Penny held it from 1983 til ’95, Republican Gil Gutchnecht won it when Penny retired and served 12 years until Walz unseated him in the GOP wave of 2006. How many years will Walz have been in office come the end of his current term? You guessed it: 12. If 2018 is to resemble anything like the Trump repudiation Democrats are hoping for, the party should be able to hold the seat. As for Walz, it was thought that he had decided against running for Governor when House Democratic leaders awarded him the position of ranking member on the House Veterans Affairs Committee. Walz , whom The Almanac of American Politics cites as being “the highest-ranking enlisted soldier ever to serve in Congress,” has developed a strong statewide niche. But Minnesota seems more likely than not to lose a House seat after the 2020 census which would make taking on more Republican turf inevitable. So Walz may rightfully have concluded that another cycle like 2016 would finish him. Walz’s problem statewide is that while he can boast of durability and name-recognition in the Southern portion of the state, he is dwarfed by State Auditor Rebeecca Otto, St. Paul Mayor Chris Coleman and ex-State House Minority Leader Erin Murphy. His biggest decision might be whether to take part in the DFL Convention or take his fight to the voters in the August primary. Either way, his odds at this point are precarious enough that it would probably behoove Walz to think long and hard about giving up a strong shot at chairing the House Veterans Affairs Committee post 2019 or in the future. In closing, Renacci and Walz are determined to pursue the newest ventures of their political careers but, if for whatever reason they don’t pan out, party leaders at home and in D.C. will likely welcome them back with open arms.